Have you ever wondered why–in almost every environment–conversations and programs around diversity and inclusion are so difficult? Why is it that despite efforts to make organizations more diverse, there seems to be little to no substantial development where it really counts? Well, if you watched the above video, you know what my take is. I believe that diversity and inclusion efforts are such a failure, because they are based on a false premise. Somehow a majority of people (and I don’t mean a particular group of people) have convinced themselves that there is such a thing as a world that is not diverse–that there is an exclusive reality and that there are some special people who determine who is welcome and who is not. There are even those who work in the area of diversity and inclusion from every background, who somehow retain this mentality without even knowing it. Speaking about D&I, they think they are talking about a new thing; not realizing that when they try to convince people of the virtues of D &I, that what they are actually doing is trying to awaken their listeners to the only reality of the Universe. The fact is that reality is diverse and includes all that there ever was, is, and potentially could be or could have been. Nothing is excluded in this Universe–not even things that are imagined. If that makes no sense to you, just go to a movie or read a book and pay attention to how you are affected by it. As Einstein said, “Imagination is even more important than knowledge.” Does that idea blow your mind? Of course it does. It should. That’s what happens when our illusions are pulled away. And it’s why we avoid change so much. It’s a scary thing. Or at least it seems like it is a scary thing until we realize that even our fears are illusion. OK. OK. OK. What am I talking about? 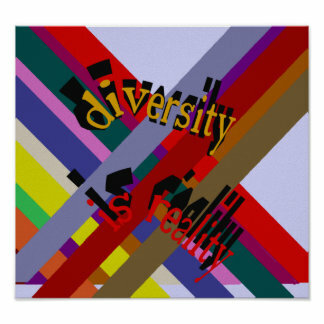 Obviously when I chose the title The Reality of Diversity and Illusion, I was trying to make a point about diversity and inclusion efforts that are popping up everywhere from the production line to the pulpit. Well here is the point I am trying to make–if you are not conscious of the Ultimate reality of diversity then you are living in an illusion. Diversity and Inclusion does not take any effort at all. It is reality. What takes effort is us unlearning the falsity that we are living in. That’s always been the challenge. Let’s look at Galileo for example. Did he place the sun in the center of our solar system or did he use the observable data and come to the only possible conclusion–that the sun is exactly where it has always been ever since humanity first observed it? Trusting the wisdom of his scientific forebears and using a telescope he proved what was already true whether anyone accepted it or not. And how did people respond? Well he was arrested, deemed a heretic (people who embrace diversity of thought and choice), and persecuted. Why? Because people often prefer a comfortable lie that they are used to over the truth that would bid them to transform. When the truth is revealed, more times than not, egocentric people see what they have to lose rather than what humanity as a whole can gain. Revealing the reality that actually already existed brought trouble upon Galileo’s head because there were people who were unknowingly building their beliefs, way of life, and intended future under the a limited paradigm. Not that this in and of itself is a crime. We are all doing this. I’m writing from a limited paradigm right now. It is inevitable. The real problem only comes when we shut down or turn away from opportunities to expand our awareness–when our errors are brought our attention and we go into denial. And that’s what happened with the people who opposed Galileo. For them, reality was the ultimate threat. It’s no different in the arena of diversity and inclusion. Here’s another example that speaks more to the realm of human relatability and compatibility. I recently watched the movie 42: The Jackie Robinson Story. If you’ve seen the film or are familiar with his story, then you are aware of the ultra-exclusive nature of baseball in 1945 and how there were people who literally believed that a black person did not belong on the baseball field. They believed there was such a place where other people did not belong. Lazy-minded Hitler thought like that. He believed in an exclusive reality where only certain people are invited. I call him lazy because he did not use his talent to expand his mind, but rather took the lazy way out and contracted his thought to a limited worldview that excluded people who did not fit into his concept of value adders. The thing is that this is not God’s reality. So here’s a question: What would happen if it became popular for people to accept God’s ever present reality of diversity and inclusion? Well people attached to the current dominant and exclusive worldview may likely see it as a threat to their beliefs, way of life, and intended future just as the people did when Robinson first stepped on the field. His detractors were too lazy and afraid to see the opportunities the work he was doing was creating in our society, because they knew if people accepted the Universe’s reality of D&I that Robinson embodied, the next thing you know they would actually have to accept the reality of Universal Equality and really who wants to believe that? So, why am I pointing this out? Well basically I am showing that there is a precedence for the belief that God sees everything as equal. Now of course we could use that logic to create all kinds of problems. We could get into ethical and moral conundrums because that is what people do when they try to avoid what is right in their faces. So let’s just skip all that. Chances are that if you are reading my blog, you are not a person who has a problem believing in an idea that there is a God who sees all of life through an equally loving lens and that you can have access to that point of view. And even if you are not a believer in God, you have witnessed enough life that you know that denying the reality of diversity is fruitless. The worse that can be said about people like us is that we don’t know what to do with our awareness. Well, my friends I am in the same boat. I accept that we are all One and that God views us all from a place of total love and acceptance. Yet, I struggle with the challenges that comes with accepting this reality and observing what appears to be injustice in our world. So that is what I am inviting you readers into–a struggle. In Romans 1 Paul also teaches that “since the creation of the world [God’s] invisible attributes are clearly seen, being understood by the things that are made, even [God’s] eternal power and Godhead, so that [we] are without excuse”. Elsewhere in Ephesians 3 he prays that his hearers know the love of Christ which surpasses knowledge so that they can be filled with all the “fullness of God.” I share this to say that there are people who believe that it is possible for us to directly experience the Universal and unconditional love that embraces God’s inclusive and diverse reality. They have abandoned the illusion of separation and are doing the work within themselves to live in this ever expansive reality that I am calling God’s reality. Friends, making this shift will not be easy. In many ways it feels like it goes against our impulse to survive and protect our physical existence. But if you have ever loved anyone, you know that this is nothing new. Love compels us to accept difference and to expand the limits of our own being in order to be in relationship with another person or people. Many of us have even knowingly put ourselves in harm’s way for what we feel is love. Now if we are able to do this with our limited awareness of reality, how hard can it be to imagine that God does infinitely more in the name of love? Perhaps if we could see this, Jesus’ actions as well as his inaction would make a lot more sense to us. That being said, I will leave you with Paul’s treatise on Love from Corinthians 13. It is probably one of the most well-known and widely used exhortations on love. It is particularly popular at weddings where people are most open to acceptance, inclusiveness, and work love demands of us. My hope is that if you are reading this, you do not allow yourself to be distracted by my Christian language to distract you from what I am saying and are able to translate this message into the language that suits you best. As I said in the video that accompanies the post called, Pour Yourself Out, “God speaks all languages, but is not limited to any of them”. So if anything I say is unclear, I pray that it gets to your heart in the way you can receive it, because the Love that embraces the reality of our diverse and inclusive Universe is the greatest gift there is. 4 Love suffers long and is kind; love does not envy; love does not parade itself, is not puffed up; 5 does not behave rudely, does not seek its own, is not provoked, thinks no evil;6 does not rejoice in iniquity, but rejoices in the truth; 7 bears all things, believes all things, hopes all things, endures all things. 8 Love never fails. But whether there are prophecies, they will fail; whether there aretongues, they will cease; whether there is knowledge, it will vanish away. 9 For we know in part and we prophesy in part. 10 But when that which is perfect has come, then that which is in part will be done away. If you are interested in seeing how imagination can influence reality in a positive way, check out The Pleiadians by Dr. Bill Guillory, President of Innovations International, an organization that specializes in the areas of diversity, inclusion, and transformation. As I’ve tripped through life, I have encountered enough of myself in others that I cannot deny the reality that our Universe is at the same time both diverse and inclusive and yet eternally One. In Jesus’ teachings I see an invitation to see the world from the God’s eye view–the view of unconditional Love. Thank you so much for this article. I loved it! I’m glad it spoke to you. I hope you’ll feel comfortable passing it on to others you think will resonate with it. You go Pedro! What you said makes so much sense to me. I also had the experience when young of living in a neighborhood where there was diversity and found that I responded to each person as an individual rather than what their to their race, creed, sexual orientation, etc. and am in agreement with you — diversity is reality and it is our fear that leads us down the road of needing exclusivity. I’m glad I listened to you today. I am glad you listened as well so that we could have this exchange. The more I live the more I am able to articulate that which has always been evident to me–we are One. We are hiding pieces of ourselves in others and when we close our hearts to those who come as our mirrors, we miss out on knowing ourselves more deeply. Thank you for your courage to share you with others and for commenting on this post. When we comment on things that speak to us, we are making an imprint on the world. We are casting our vote on that for which we speak up. it is a simple way to be a part of creating a world of awareness. If you know others who might be like minded, pass this on. The internet makes it easier for us to find each other. We might as well take advantage of the opportunity.